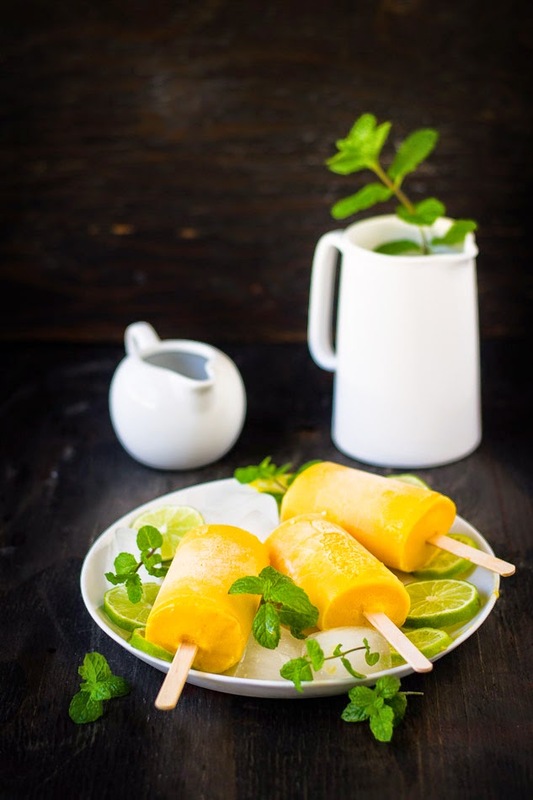 Just before bidding goodbye to Summer, today I am going to share a perfect recipe for this season - Mango Lassi Popsicles. What could be more satisfying than a mango drink in this summer! 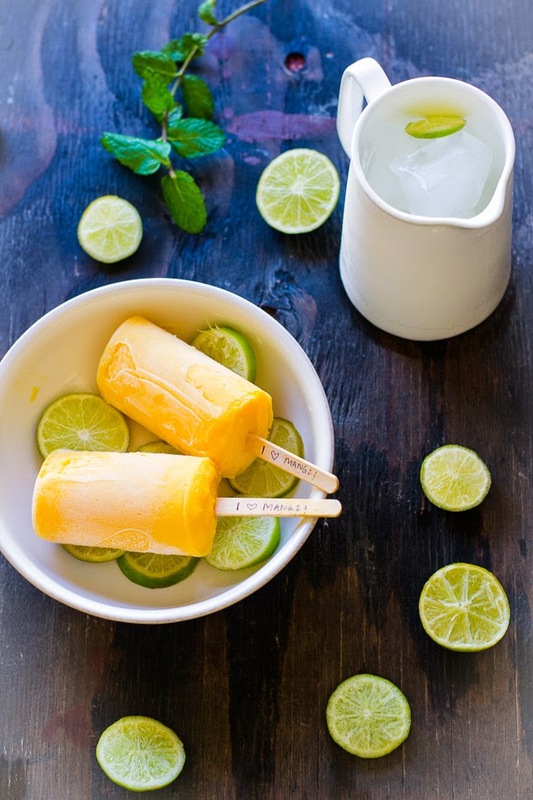 This frozen Mango lassis is just too appropriate for beating the current heat wave of southern California. Specifically September and October are the hottest months here in San Diego. When we came here five years back, the climate was very pleasant but in last three years, there was not much rain and summer is not pleasant anymore here. Good news is that we have only one more month before the winter starts. We have been making ice pops, ice cream and ice cream cake for most part of this summer to beat this heat. 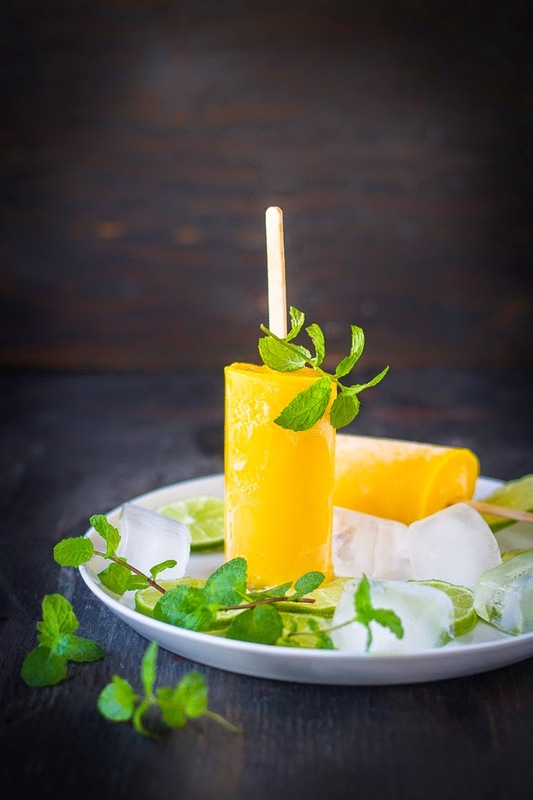 This ice pop recipe is a nice after-school snack that your kid would love to have. It is creamy, smooth and has tart flavor. It can send you back to your childhood days because in some parts of India, without mango or mango lassi, summer vacation was not complete. In India, Lassi is nothing but a traditional summer drink which is similar to fruit smoothie. On the other hand, many Indians keenly wait for summer only because of Mango. So a combination of these two is so perfect for them! Other than mango lassi, there are other kinds too like salty, sweet or bhang lassi. The last one is very popular in northern part of India during the festival called Holy. It is made out of “bhang”, a liquid derivative of cannabis. In Indian sub-continent, Bhang has been used as an intoxicant for many centuries. Mango lassi is a blend of mangoes , yogurt, sugar and a touch of spice. I combined all of the above in a food processor and made it as smooth as it can be. You can swirl it into popsicle molds with some mango-less yogurt/milk mixture for a pretty smooth affect. 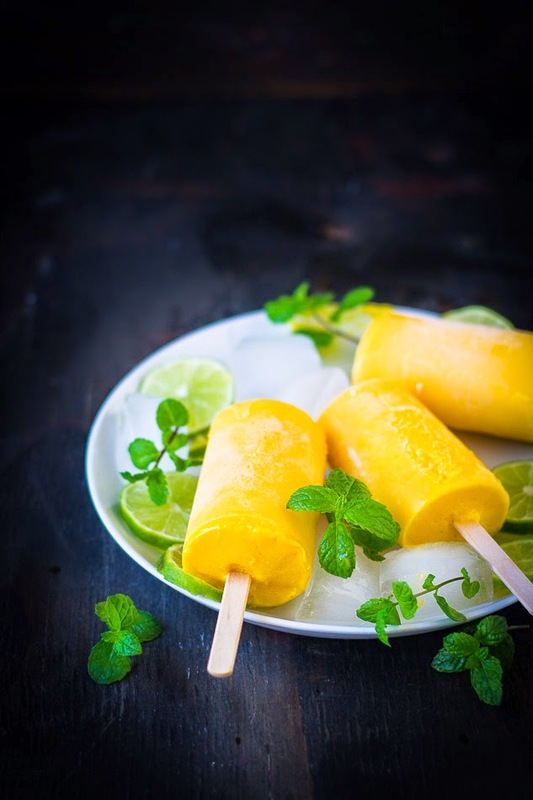 Now Mango lassi in popsicles are ready to freeze. Making popsicles is major fun and so easy that even a novice can make it. You don’t need to worry if you don't have Popsicle mold. You can use paper cup, take some glasses or muffin tins and pour the mixture into the same and then freeze. 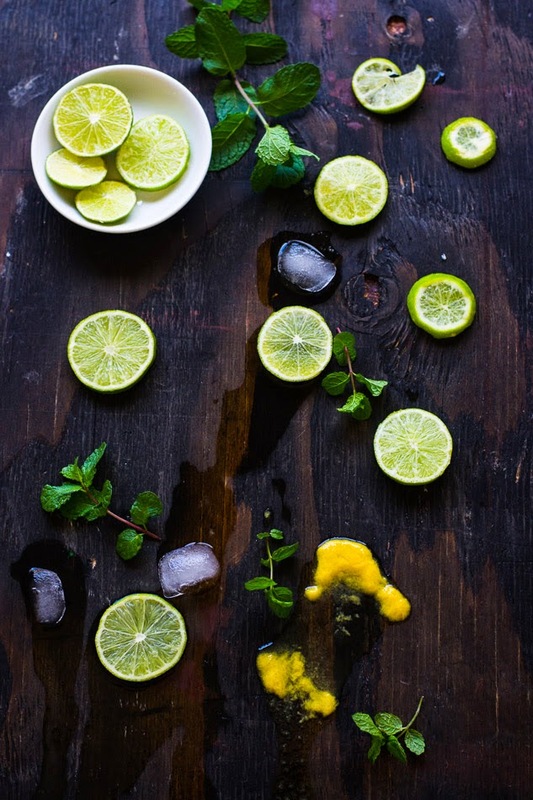 In terms of flavor, the options are endless. You can change the flavor as per your taste and choice. The yogurt makes the popsicles so tasty and creamy. If you like your pops icy, better to skip the yogurt and make it simpler. Sugar : 2 tablespoon, or to taste. 1. Combine mango, yogurt, sugar, ground cardamom in a food processor or blender and blend it until smooth. 2. 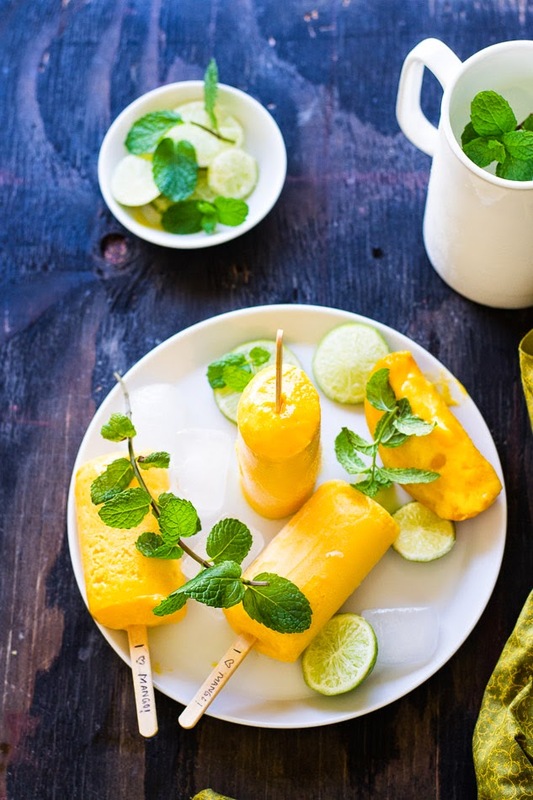 Pour the blended mango mixture into the popsicle molds or small paper cups and freeze for one hour. Then push a popsicle stick into the center of each pop. Place back in the freezer until solid. 3. To unmold, place the mold up side down under warm running tap water. Beautiful capture - love it !